A fascinating walk along the city's formidable system of fortifications, with imposing fortresses and breathtaking scenery. In the company of our local guide we climb to the panoramic heights of the hill overlooking the city, from where we can admire a breathtaking view of the hamlet that was once the legendary Ragusa. 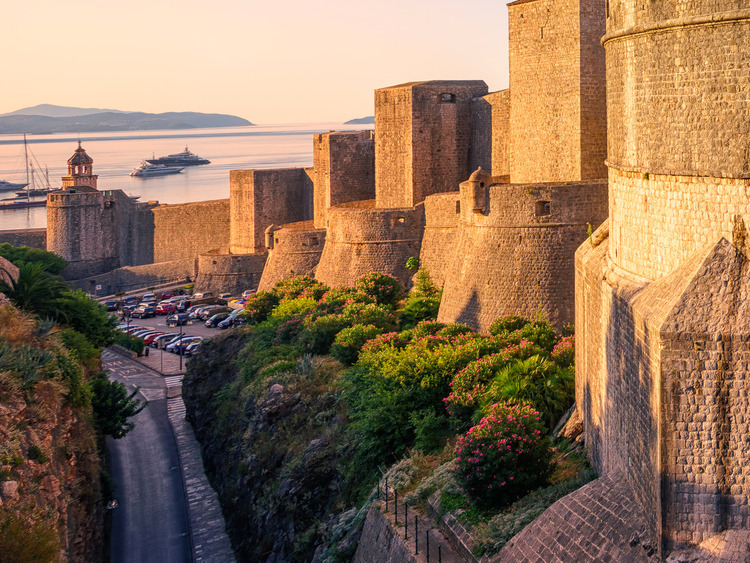 We then return towards Pile Gate where we begin our walk along the city walls: an imposing system of fortifications, among the most beautiful and best preserved in the entire Mediterranean, which still protects Dubrovnik's historic centre today. On a panoramic route of nearly 2 km, we walk along the city's bastions, admiring spectacular monuments such as the Minceta Tower, a powerful and monumental fortress that is a symbol of Dubrovnik, with its mighty round body towering dramatically above the city's highest point, dominating land and sea and protecting the inhabitants from all threats. We proceed to Fort Bokar, a circular stronghold built between 1564 and 1570, whose strategic position dominates the open sea and protects the western port, the moat and Pile Gate. We then move on to St. John's Fortress which hosts the Maritime Museum where we can learn all about the city's great naval traditions, its maritime history, its sea captains and its skilled ship builders. We spend some time at the Maritime Museum looking at documents, prints, portraits and model ships that bear witness to the major maritime development of the Republic of Ragusa and the evolution of steamships. The excursion involves a long walk, it is therefore recommended to wear comfortable shoes. Guests can return to the ship on the shuttle buses provided. ?